“Floods were never seen as disaster; they were a blessing to the village, until recently,” remarked a nonchalant Chandrasekhar ji from Vina village, around 7km from Supaul district in North Bihar, located in the basin of River Kosi, which is regularly affected by floods. 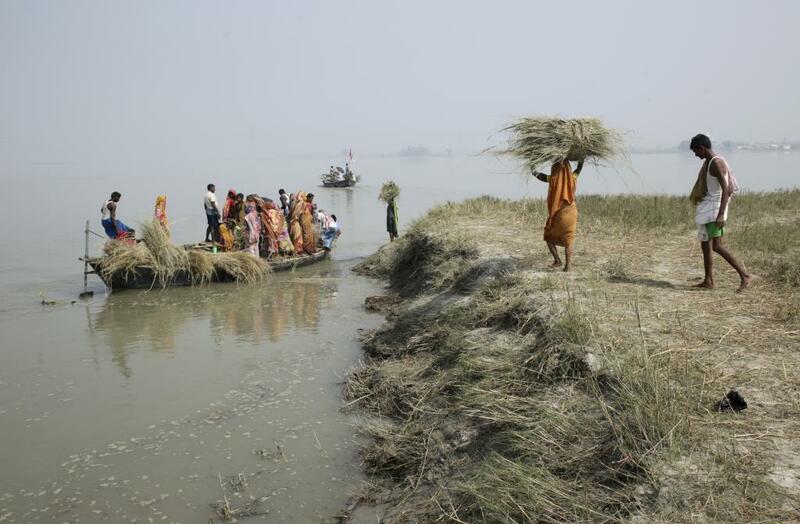 In North Bihar, floods were seen by locals as a way of life. “In fact, floods were like daughters visiting their father’s place; she is welcomed with open arms, but must go back to her abode,” says Neelam, a middle-aged woman from Menahi village, Madhepur block, Madhubani district. However, in recent years, the intensity and frequency of floods have increased significantly. The Himalayan river has one of the highest annual sedimentation load in the world, making it highly prone to flooding. Add to that climate change-induced glacial melting, that causes water levels in the Kosi basin to increase dangerously. This leads to more silt, and hence, catastrophic floods and related disasters. As a result, most villages in North Bihar are forced to relocate along with their livestock to the other side of the embankment during monsoons. It is an endless cycle where houses are built and destroyed. Among other anthropogenic reasons, including several interventions for water resource development, excessive siltation forms a central part of this problem. “Kosi has been changing its course whimsically. We have seen it change its course twice in the last ten years. The land that you are walking on was a deep flowing river a few years ago. All we can see now is the bed of silt everywhere, where usually we used to find fertile soil,” says Baldev Jadhav, Narahia village. Kosi has been referred to as the ‘sorrow of Bihar’, meandering and depositing fertile fields with abrupt heaps of silt and tearing away big chunks of land. During monsoons, the huge amount of water coming from the catchment area of Kosi makes it difficult to move through silt, thus resulting in overflowing. In summers, it is spread across in patches of silt and water. “The amount of silt deposited in Kosi has only increased over the years”, says Ram Chandra Paswan, a primary school teacher in Naraiya village. He claims that there is a minimum increase of 5-6 inch of silt every year. River embankments are expansive and the dilapidated school building can be seen standing in the midst of the accumulated silt. On the other side of the embankment, new low-lying land, known as chaur, is continuously formed due to deposition of silt, which remains waterlogged throughout the year. Thousands of acres of existing arable land have become water logged, causing tremendous loss to crops. Livestock rearing has also been impacted as excessive water logging leads to limited grazing land. 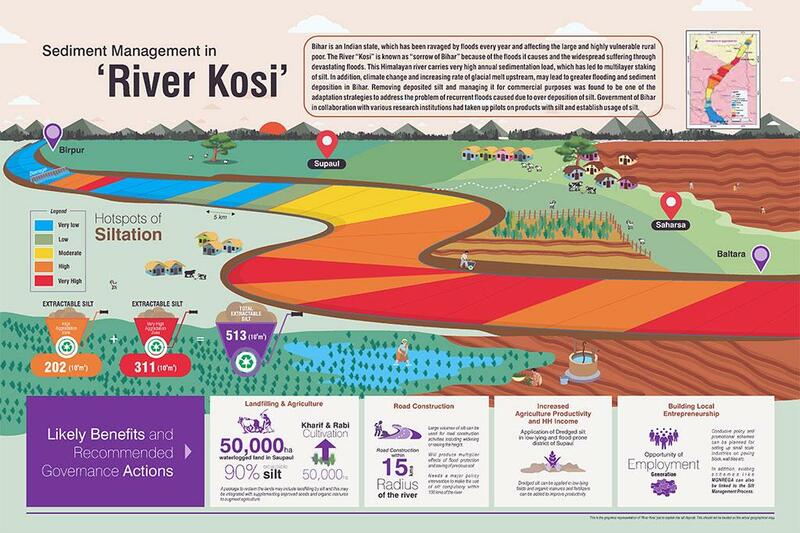 Silt has also led to a shift in traditional crops as it leaves no water retention capacity in crops. Hira Devi, a farmer from Narahia village says, “I have been living in this village for about 25 years. Farming has only been getting difficult day-by-day. We are resettling here and there; the land keeps varying year after year. You sow a crop on this land today, and tomorrow you see dunes of silt everywhere. The sheer amount of silt and uneven land due to shifting of deposition of silt makes farming, which is the only occupation we have, very difficult. We are always uncertain of what tomorrow holds for us”. Uneven land makes it laborious to walk and commute from one village to the other. Irrigation is another issue as the area is battered by either too little or too much water. In Mokama Taal, near the Ganga basin, traditionally grown lentil has vanished due to excessive silt deposition. Wheat, its replacement, is not as profitable. Getting rid of the excessive silt is one of the many ways to solve the problem and villagers from Piprahari in Supaul block have found a way: water purification by using silt-based drinking water pots. Apart from pots, excessive silt is also being used to build roads, landfills, brick making, and roadside excavated fields. Villagers are bracing against floods by mostly making houses from the silt. “They have to find a way to adapt to these volumes of silt. If government supports the poor farmers in dumping silt in their respective agricultural low-lying land, it will be very helpful for them. Although it may not yield immediate results, it will become upland, and the farmers can then use manure to make it suitable for crop cultivation. The lands would be better than the waterlogged soil where nothing is possible,” says Chandrashekhar ji. The communities are also looking at ways to cultivate crops that can be grown on silt instead. Even though Kosi silt is slightly deficient in nutrient value, some villagers suggest that alternate crops such as watermelon can be considered by supplementing it with compost for improving soil fertility. The state also joined hands with an initiative by the UK government, the Action on Climate Today (ACT) to create innovative methods for silt management from Kosi. The top-most adaptation strategy was estimating the amount of silt deposited and managing it for commercial purposes. This could address the problem of recurrent floods caused due to excessive deposition of silt. A study under the joint initiative shows that the excess silt has proven utility in reclaiming lowland and waterlogged areas, which can further help mitigate floods. It can also be used in low-lying agricultural fields, in road construction, brick manufacturing, new landfills and perennial horticultural / medicinal crop cultivation, thereby leading to increased production and household income. The study also recommends integration of Mahatama Gandhi National Rural Employment Guarantee Schemes with the silt management process. ACT is providing policy recommendations on how to manage the de-siltation process, and a comprehensive framework that can be applicable to other rives of Bihar. Excessive siltation in the Kosi basin is an impediment to the state’s growth and development. The state has for the first time an assessment of the amount of silt deposited and will be better positioned to develop a sediment management framework. Most importantly, the commercial benefits proposed can help transform the story of a disaster into one of opportunity. In order to use silt for various purposes, including flood prevention, brick making and building roads, ACT prepared a full-fledged silt profile of River Kosi in Bihar. They used data from an IIT Kanpur study by Professor Rajiv Sinha that explored the techno-feasibility aspects of silt extraction from Kosi River and assessed the rate of sediment deposition using a carbon dating method. Specific properties of silt from different depth and length of the river were also assessed. Since silt has different physio-chemical properties in different locations, only site-specific silt can only be used for specific end use. Additionally in order to protect the hydrology of the river, the morphology needs to be protected as well. The need for this measurement was felt because available data on silt deposition over the years was not enough to substantiate a first order estimate of siltation in the Kosi channel belt between the embankments. The commercial viability of the various silt types were estimated for the first time. (The author is a Knowledge Management & Communications Consultant with Oxford Policy Management Ltd., South Asia).